Baichung Bhutia is the best and most played footballer for India. This article gives you complete information about Baichung Bhutia. retirement and profile. More details about Words said by bhutia at the time of retirement is also quoted in this article. Baichung Bhutia made his retirement declaration on Wednesday August 24 2011. India loose a best captain and footballer as the retirement of Baichung Bhutia from International football. Baichung Bhutia was born in the year 1976 December 15 at Tinkitam, Sikkim, India. Baichung Bhutia is the best football player of Indian team. Baichung Bhutia played 16 year in International football for India and various clubs. Bhutia is the best player of Indian football history. For the last one year Bhutia was not in the field due to injuries. Baichung Bhutia has scored a total of 43 goals in International football. He is the highest goal scorer for India in International football. Baichung Bhutia was the Captain of India for 10 years and played 100 plus matches. For his amazing contribution in football, Baichung bhutia was awarded Arjuna Award and the Padma Shree. Bhutia will continue playing football for his club United sikkim FC.The most played club of Baichung Bhutia is East bengal. Baichung Bhutia started his International Football career for India in the year 1995. Baichung Bhutia holds the record of highest goal scorer for India in football at the age of 19. In 2002 Bhutia scored two winning goals in the final of 2002 LG cup. Bhutia showed his best performance in SAFF Championship 2005 where he was the captain that time. Bhutia was awarded Most Valuable Player and Fair Play trophy for his brilliant performance in the tournament. 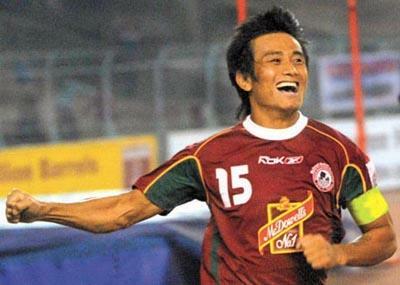 In 2008 AFC Challenge Cup Bhutia scored two important winning goals to reach the semi final of the tournament. Bhutia played his 100th match for India in 2009 Nehru cup which is the most important match of his life against Kyrgyzstan and win the match 2-1. "I had fantastic 16 years of international football. I enjoyed every moment to have represented the country, to have contributed to the game." "Winning the AFC Challenge Cup in 2008, to qualify for the Asian Cup were the best moments of my career and I thought of retiring after playing in that tournament,"
"But I could play only 15 minutes in the Asian Cup and I thought it was not the right way to retire. I wanted to continue playing but the last 7-8 months have been frustrating due to lot of injuries. So I have decided to quit,"
"Lots of things in life do not happen the way we wish so I am quitting from international football but will continue playing for my club,"